Dinosaurs, Dinosaurs, Dinosaurs.... it's all about the Dinosaurs, Opeie is hooked and he has surprisingly dragged his brother in on all the excitement. These wonderful beasts have kept us well entertained over the last few weeks with some great themed activities. Earlier this week me and Opeie were chatting about his new favourite subject and we got on to the topic of whether there is a dinosaur for every letter of the alphabet. Obviously a conversation like that is clearly going to kick start an activity. I wanted to answer Opeie's question but i didn't know myself so aside from the fun of finding out if we could complete a dinosaur ABC i wanted to show Opeie how we find the information we need. We headed down to out local library, we can walk to which is great so we went looking for books that could help us with our task. I'm always surprised at how quiet our library is most of the time. We've been there today and considering it is the school holiday and it was raining out it was a ghost town. With a stack of books to scan out we headed home and found out a big roll of paper ready for our fun research activity. We wrote A-Z down the one side of the page and then started by seeing how much we could fill in from the information we knew ourselves. I thought Opeie would go straight in for his favourite Triceratops but he actually started from 'A' and shouted Archaeopteryx which i was really impressed by, followed by Brachiosaurus. C was our first issue but we did manage to fill in quite a few before turning to our first research device, books. As expected there was a great source of research material at the library and as we sat in the hallway surrounded by books we looked through them together hoping to fill in all the blanks from our dinosaur ABC. We managed two thirds of our activity before Opeie wanted to move on to something else, so today we picked up where we left off and got stuck in hoping to complete what we had started. This time though we had Seth on hand who turned out to be an excellent researcher. We had looked through around 20 Dinosaur books but we still hadn't completed our A-Z so we moved on to our next place for information, the internet. Now i know we could have just gone straight on to the internet to get all the relevant information we needed but wheres the fun in that? 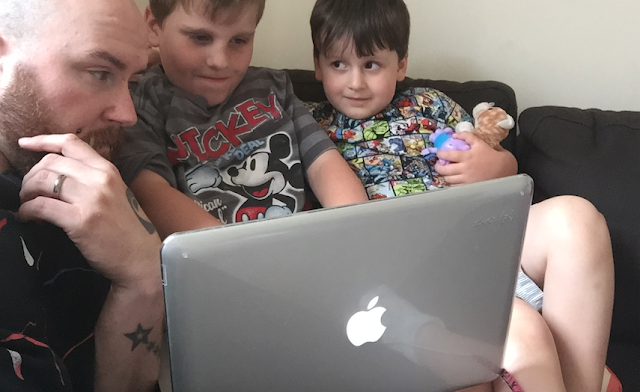 The boys love reading and going to the library and i think it is really important for them to know that that information is there readily available to them, i did explain though that sometimes the books and information are not always on hand and that is where the internet will reign supreme. The National History Museum's Dino directory filled in all the gaps we needed. Saying that though we were only missing F,J,X,Y and Z so we had done pretty well. We also learned some interesting facts too as we searched on the 'in your country' section and found out that 23 dinosaurs were discovered in England, we are unsure how accurate this is though as Opeie pointed out that all the Pterosaurs were missing from the directory. Thanks to some great researching from the boys we found a dinosaur for every letter of the alphabet and picked up some great dinosaur facts a long the way. I cant stress to people that i meet enough about the importance of using the library and the information that is available to you cost free. Having access to that kind of literature is a great tool for children to be able to use in all aspects of their learning. *NOTE, Opeie was so excited about 'W for Wooley Mammoth that I didn't have the heart to tell him.